As my son prepares for university my advice to him is uninspiring –go to university for a good paying job, not a dream. Maybe 25 years ago I could have told him he could have both, but not anymore. Pick a practical university program that is very specific- conducive to becoming a teacher or a lawyer. Or better yet, go to college and become a mechanic or an administrative assistant –formerly secretary. At one time a university education seemed like a good guarantee for a good job. I know many people comforting themselves with their parchment as they rock back and forth wondering how they’re going to cover the rent and eat. They squeeze their eyes shut as they try to will a decent paying job to fruition. Forget working on a career. Many of the educated are working on just getting by. Struggling as a small business owner, I’ve come to accept that my university education and all my hard work isn’t going to guarantee me a comfortable wage. I’ve accepted that my days off come when I’m too exhausted to work anymore because when you are just getting by you can’t afford weekends. But there will be some people that think I can still work harder. Or that I haven’t looked hard enough for ‘a real job’. You know one of those ‘real jobs’ that so many thousands of the Sault’s working poor can’t find. There must be something wrong with us. I was speaking with a friend the other day. We were talking about my ‘career path’. He asked me, “What do you want for your life? Where do you want to be when you’re 60 years old? Don’t you want to travel? Buy a new car?” It struck me at that moment that there are hard-working and lucky people that can’t even wrap their head around survival working. My answer was, “What would make me the most happy would to never have to worry about whether or not the bills are going to be paid this month. And to have just enough to keep a little garden going, share a lunch out with my friends every now and then, and buy the good bottle of wine once in a while.” And honestly, to me, that would be living the good life. When you are on the lowest tier of Maslow’s hierarchy of needs thoughts of vacations in Italy, home ownership, a new Audi and self-actualization are just silly. The working-poor only have time for reality. And maybe focusing so much on what you might never have might be making you more miserable, and making you feel poorer than you really are. After you get the bills paid and get the food on the table is it ok to be happy and satisfied? What if you really are content with simple pleasures? Does that make you a less complex, less interesting person? What does it mean if you embrace a lifestyle within your means? Does that make you unambitious, not hard-working? What if you don’t have to work hard to just get by and you’re happy with ‘just getting by’? Does that make you lazy, a bad person? I’ve started asking myself these questions not in regard to my life only but also because I meet so many people, with various educational backgrounds, who are at odds with their employment situations- not having enough of it, not earning a sustainable wage, having to put in full-time hours to maintain their part-time employment, working an excess of low-paid hours to make ends meet, or bouncing from one contract to another contract. I was recently speaking with a friend about her struggles as a working poor single mother. “Lydia”, is on the cusp of 40 and a parent to her autistic son. I picked her up from work the other day. We grabbed a hot chocolate and parked down by the waterfront to catch up. Her story is familiar to me because it sounds like my own. I also gave up a job in non-profit earning about $16 an hour (part-time) to go back to school as a single parent. My B.A. acquired me enormous debt and I entered the job market underemployed and earning less per hour prior to obtaining my degree. Lydia is not as bitter as I am about her educational experience, expressing that she believes the real crime is that access to post-secondary education is not a right afforded to Canadians. “I think education is very important. I feel better about my life and about myself as a person. I think the system is a death trap. The fact that we are exploited so much and made to exploit others is the death trap,” she says. Since attaining her degree, Lydia has begun working on a master’s degree. Last year, in grad school, she was trying to keep up with rent in Sault Ste. Marie, as well as her out of town rent while in school. No longer eligible to receive OSAP, Lydia was paying her grad tuition on her own. During this time she was earning about $800 a month as a teacher’s assistant, collecting $500 in child support and receiving a child tax benefit. She estimates that she was netting about $1650 per month. She returned to the Sault in May and picked up a contract that ran until the end of August and began earning about $1600 per month – for a total of $2450 per month. Then back down to $1650 per month between September to December while she worked another $800 per month contract. And right now, Lydia is bringing in $2450 a month having picked up another contract that expires in March. So far- Lydia doesn’t have another job or contract lined up beyond March. Between all of these contract jobs, Lydia balances about 3 other gigs that occasionally allow her to pick up some extra change to give her grocery budget a little boost. As Lydia rhymes off her earning and expenses she has a stunned, frightened look on her face and I totally get it. As necessary as it is, it is also a bewildering feeling when juxtaposing your cash and costs, particularly when your costs way exceed your cash. “I’m like, maybe I just don’t know how to manage my money. It sounds like I should be fine. Someone out there is going to read this and think I have it made.” Lydia presents this more like a question and she is looking to me for an answer and I don’t have one. It sounds like a pretty crappy deal to me. It’s hard to be a successful manager of money when you don’t have enough money to manage. I can feel my own anxiety rising as I consider her situation. I know how challenging the road ahead will be for Lydia, barring that freaking thing all of us who work hard want –a decent paying job. Lydia gives herself a hard time, questioning the choices she has made. “I’m not a conventional person. Maybe if I just wasn’t myself… But I know I’m not the only woman that wants to go and get an ‘ejumucation’,” she laughs through her tears. Lydia filed a complaint with the university who chalked it up to a matter of miscommunication. So she just absorbed those devastating blows –the first blow from the jerk who made the comment, then the second blow by the university that didn’t care that the jerk made the comment, and added it to her growing pile of self-doubt and depression. People tell her “there’s jobs out there, that she’s “not looking hard enough” or that she’s “not hungry enough”. Lydia leans her head back onto the headrest and stares out at the St. Marys River. We don’t say anything for a while. I don’t know what to say, so I ask her what she’s feeling. “I feel overwhelmed,” she says slowly. “I feel like I’m missing the point or maybe if there was some way I could see something differently I could get myself out of this or figure this out. But I have to stay in Sault Ste. Marie.” I ask her if that’s because of her son. She nods. She would have to leave him behind to take work out of town and for this mom- that’s not an option. So why not give up her dream of a career? I have recently come to the conclusion that only a few lucky people –the people that like Lydia who have worked really hard, are really smart and really creative but were lucky to be in the right place at the right time or maybe had a special in, can have a career. It is not true that if you go to university and work hard that you’re going to get a great job- with health benefits. It’s time to stop the spread of that bull sh*t.
I don’t outright ask her why she doesn’t give up, and I don’t mean to say that she should give up further education and the pursuit of an awesome career. But I think I have an idea why it’s so hard for Lydia and other people like her to not give up. After years of education and all the debt racked up to get those pieces of parchment, and after slogging it out through one contract job after another, and after making yet another promising new connection in your career field, and after getting so much better in your area of expertise, that unique opportunity that’s going to land you that dream job that rewards you with a professional salary and benefits that you surely deserve -is just on the horizon. You cannot, will not, give up and go and get that call centre job Monday to Friday, and waitress on the weekends. And you can’t even do that part-time because then you can’t invest 60 hours a week into your low-paying, overworked contract/entry level job that provides you experience in your field because you need that as your stepping stone to reach that perfect job that is just almost within your grasp. And, I think, that is what all of us who are like Lydia, are thinking. And that also means there’s a pile of us all stretching for that carrot- but there’s just one. If success is measured by home ownership and assets, some of the most successful people I know have barely, if, completed high school. Let that sink in. If success is measured in terms of making a difference, doing something purposeful, being a good person –then we can all achieve that with or without a framed degree. I believe that higher education is important but I no longer believe that higher education must come from an institution. We have placed far too much importance on the institution and those with privileged tenure who get to decide what agenda to propagate before starry-eyed students. Universities often tout themselves as a place where people learn to think critically. Well, maybe so but I’d say in today’s area of digital technology, where information is freely found at our fingertips and where any thoughtful person can seek meaningful discourse if they choose, I might suggest that the university setting could become redundant- unless you want to become a doctor. I pulled up all the latest research about all of the issues Lydia highlighted above. I considered tying all of that information into this piece but I’ll do that for you next time. All of the stats are interesting and regularly updated, derived from a formulaic approach to the human narrative. An approach that pairs nicely with our personal experiences but often takes us off the philosophical course which is sometimes more important to the matter at hand. All of this reminds me of an inspiring story, Hope for the Flowers, by Trina Paulus. When I was 12 years old, my grade seven teacher- Terry LeBoeuf, introduced me to that book. 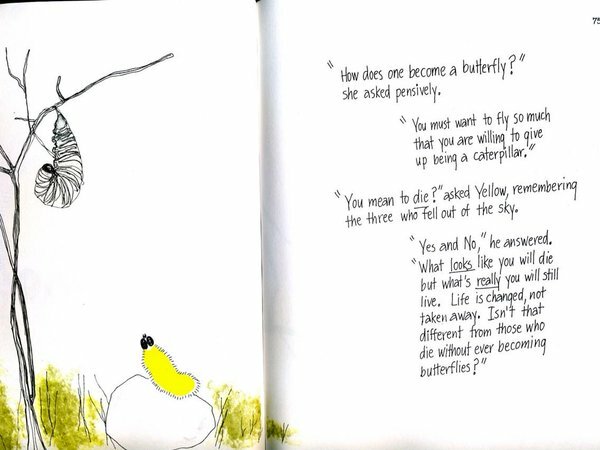 It is a beautiful story with a simple message –Get off the caterpillar pillar. You’re a butterfly. To Lydia, and everyone else who feels like Lydia, please read that book. And then go and spin your cocoon. It’s going to be ok Lydia. It really is.